Sometimes on my runs when I am having a tough time, I day dream about other stuff. Don't get me wrong, I love it and I am grateful for every run good or bad, but sometimes it takes more mental toughness when I feel tired or conditions aren't ideal. Well, yesterday I was having a tougher time but I was determined to run the distance I decided I was going to run because it wasn't like I was injured or in pain or anything, I just didn't have that oomph for the last 3 miles of it. It was getting hot and the sun was beating down, and I began to think about how good cookies and cream stuff used to be. I hadn't had cookies and cream anything in ages. I used to have big bowls of cookies and cream ice cream at my Dad's house when I was little and I made a raw version with mint a while back which was delicious and also a pie, but not much since then. Even after all of that cookies and cream daydreaming, when I finished my run, all I was hungry for however was just water and later oatmeal. I spent some time with Eric and his friends in the afternoon, and while there, I watched Eric put away a bunch of Oreos. "They are vegan!" he said to me. But to be honest, you know me, I don't go for store bought things with ingredients I can't pronounce and loads of sugar at this point in my life. I just rolled my eyes at him and smiled. But, I then remembered my earlier daydreams and thought to myself, I should make something cookies and cream. Twice in one day thinking about the cookies and cream...I have to now. Of course I would make my cookie crumbles healthier and with whole ingredients. I decided to make parfaits. Because they are easy, not fussy, and no cook. It was perfect. They weren't just going to be cookies and cream though, I wanted to add hazelnuts in as well. 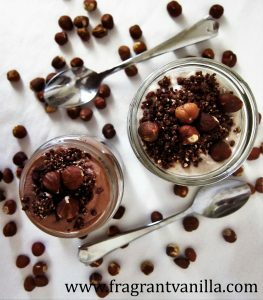 Because hazelnuts are so darn good with chocolate stuff! 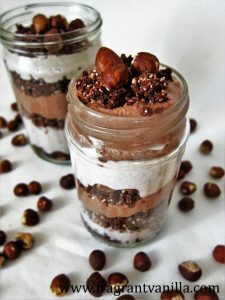 I made two layers of mousse for these, chocolate and vanilla hazelnut to be layered with the cookie crumbs. The crumbs are super easy to make, no forming into cookies required, just buzz in the food processor and they are ready to go. These ended up being super decadent and delicious and plenty sweet without being sugary. I shared them with my sugar loving boyfriend too. If you have ever been a fan of cookies and cream, try these babies out next time you have a craving! For the cookie crumble combine all ingredients in a food processor and process until crumbs and starting to hold together when squeezed. Set aside. 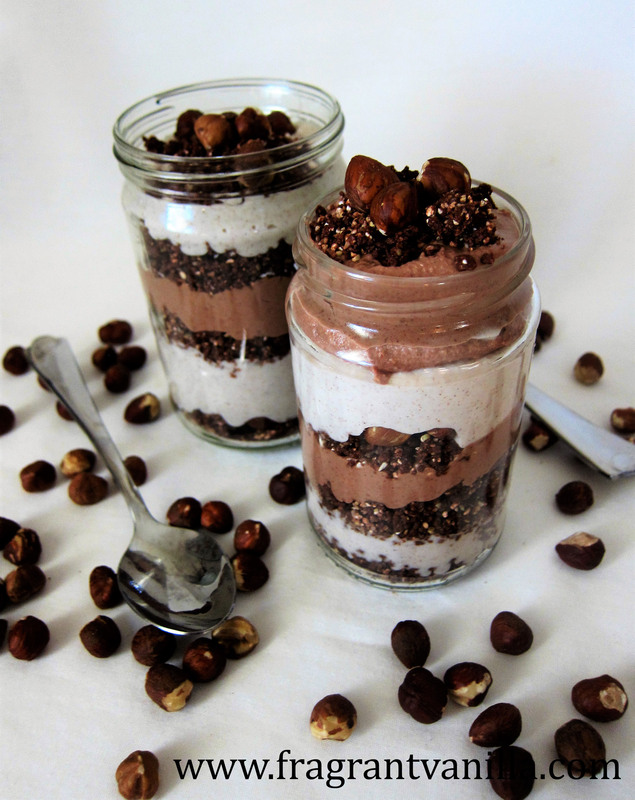 To make the mousse, combine all ingredients but the cacao powder in a high speed blender and blend until smooth. If there are any lumps at all, continue to blend. Pour half into one bowl, and half into another, and whisk the cacao powder into one of them. Place in the freezer until they are thick like whipped cream (about 45 minutes). To assemble, sprinkle some of the crumble into the bottoms of 4 smaller jars along with some hazelnuts. Spoon some of the plain hazelnut mousse over that, then some more crumbs, then some chocolate mousse. Repeat this until all of the mousse and crumbs are used up. 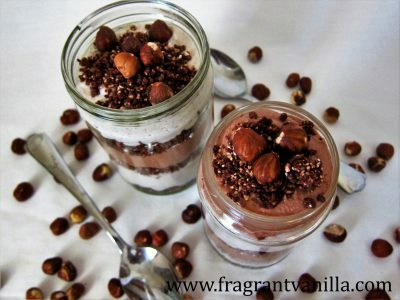 Sprinkle the tops of the parfaits with hazelnuts.